March, 2017 | H&R Group K.K. A ninja was a covert agent in feudal Japan who engaged in espionage, sabotage, infiltration, assassination and guerrilla warfare on a mercenary basis. Their methods were, irregular, and as a result they were considered “beneath” the samurai ruling class, whose strict rules of honor and regimented style combat were in direct contrast to the ninja. Over time, however, modern warfare has come around to the ninja’s way of thinking, and a resurgence in popularity for ninja has resulted. 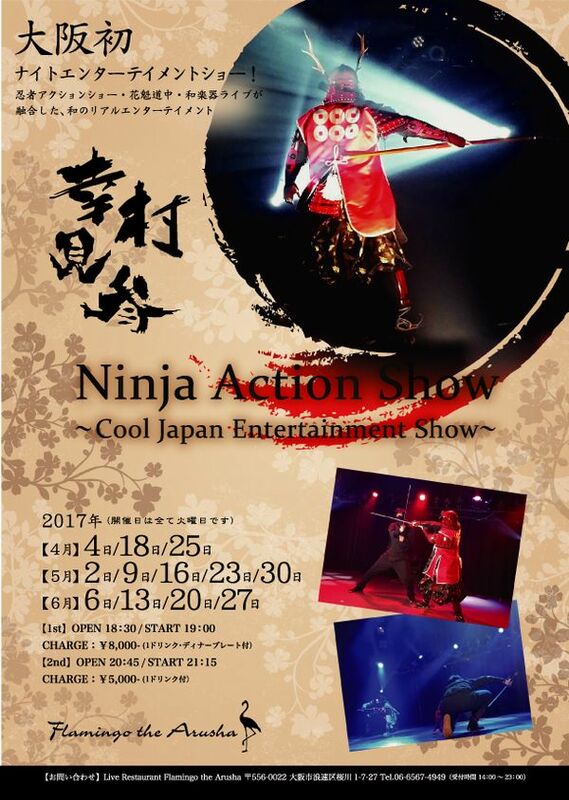 You can now enjoy the fruits of this interest, by experiencing a live action ninja show. See ninja battle it out in “powerful fights” such as “Ninja VS Sanada Yukimura” and “Hattori Hanzo VS Ninja.” Not sure how well that second one is going to go for the ninja… Hattori Hanzo is the most famous warriors in all of Japanese History! On top of all the flying kicks and sword flashes, you will also be treated to traditional Japanese musical instruments and “Courtesans.” I assume the courtesans will be be playing said instruments, but it actually doesn’t specify that… maybe the ninja play them for the courtesans in a turn about designed to further shove that thumb in the eyes of those stick in the mud samurai! Situated between the sea and an impressive mountain range, Kobe boasts an array of stunning outdoor escapes located within and just beyond the bustling port city. Kobe might not be as massive an industrial and commercial center as some of its neighboring cities, but that doesn’t stop tourists and locals from flocking to its many natural reserves for some quiet respite in nature. The parks and gardens in Kobe can be enjoyed year around, and with the weather warming into the spring, it’s a perfect time to get out of the house and enjoy all that this natural wonderland of a city has to offer. Whether you’re an avid hiker, professional picnic-er, or just happen to love the view, these natural treasures of Kobe should be on your radar this season. The mountains behind the city of Kobe, known for their assortment of hiking trails with incredible views of the city, have long been places of natural refuge. Situated at the top of Mt. Futatabi, Futatabi park holds prime green real estate that’s free for you to enjoy. For a quick, 30-minute hike or 20-minute drive from Shin-Kobe Station, you could be relaxing on the top of this iconic mountain in a space complete with a small pond, playground equipment, and a plethora of picnic tables. Just north of the Kitano district, you will find yourself in the shadow of Mt. Rokko, and the expansive herb garden along its side. The Nunobiki Herb Park is home to over 200 species of plants and herbs, and beyond the fragrant flowers and delicious teas, you can appreciate an impressive panorama of Kobe. A hike from the mountain’s base will take you up a scenic path that crosses Nunobiki Falls and will last about 40 minutes, depending on how often you need to stop and take in the setting. There is also the option to take a relaxing ride to the top in a gondola, which offers a breathtaking aerial view of the waterfall and the city below. Regardless of ascension method, a trip to the herb park wouldn’t be complete without a stroll down the rows of plants and herbs that line the walking path on the hillside. Tucked away just west of Sannomiya Station, Sorakuen offers a complete Japanese garden oasis set against the pristine Kobe skyline. Walking through this peaceful space, visitors can enjoy traditional features such as a lake, a charming houseboat, and a tea house, as well as the soothing sounds of waterfalls drowning out the sounds of downtown just outside. As a city with much Western influence, Kobe is full of diverse architecture and heritage, and Suma Rikyu park is one such inter-cultural marvel. Suma Rikyu park is a French-style botanical garden located 20-minutes by train and 10-minutes walking from Sannomiya Station. With rows of rosebushes and irises, elaborate water fountains, and a playground for the kids, Suma Rikyu is a pleasant place to spend an afternoon. For anyone itching to see some nature, but not quite ready to commit to the full outdoors, there’s always an indoor option that can be just as fulfilling. If you’re willing to put up with a few more people and a slightly higher price of admission, Kacho-en within Port Island’s Animal Kingdom is a real treat. Within a 16,000 square meter greenhouse, this park packs in an impressive assortment of exotic birds, flowers, and plants. Animal lovers can indulge in up close encounters with surprising animals, and enjoy various shows throughout the day. When the Tokugawa Shogunate finally wrested political control from Osaka and moved the seat of power to Edo in 1615, few could have imagined that four hundred years later animosity and hostilities between the two cities would remain. However each spring, the battle recommences in the form of the perennial contest between the country’s two great baseball teams, Tokyo’s Yomiuri Giants and Osaka’s Hanshin Tigers. Who are the Yomiuri Giants? The first professional baseball team in Japan, The Great Japan Tokyo Baseball Club (as they were then called) were formed in 1934 to compete against an American All-Star team featuring such luminaries of the game as Babe Ruth and Lou Gehrig. When the Japanese Baseball League formed in 1936 they took the name Tokyo Kyojin (Japanese for ‘giants’) before adopting the name Yomiuri Giants after their corporate sponsor in 1947. While their name and uniform were adopted from the New York (now San Francisco) Giants, they are more readily compared to the New York Yankees due to their dominance, having won the Central League pennant 36 times and the Japan Series 22 times. They are also one of the most widely supported teams in the country, although they are arguably one of the most disliked, with supporters of other teams signaling them out for particular antipathy. Who are the Hanshin Tigers? The Hanshin Tigers are the second oldest professional team in Japan, and are named after the Hanshin Electric Railway company that owns them. Originally called Osaka Tigers, they play at Koshien Stadium, the oldest ballpark in Japan, revered as sacred, where players traditionally bow before entering and leaving the field. Their fans are considered amongst the most passionate in the game, and in each of the 2005, 2006, 2007 and 2009 seasons attracted more than three million spectators. However, despite this support, the Tigers are considered to be something of underachievers, having won the Central League a mere five times, and the Japan Series only once. This failing to turn support into success has been blamed in recent years on The Curse of the Colonel. During celebrations of their sole Japan Series win in 1985, revelers shouted a roll call of the triumphant team, and fans who resembled the player jumped into the Dotonbori Canal. When no one could be found who looked like bearded American homerun hero Randy Bass, a statue of Colonel Sanders was thrown in. It was since believed that they would never win the title again until the KFC statue was recovered (though construction workers retrieved it in 2009 to little effect). Perhaps the true reason for the Tigers’ continued failings is the dominance of their Tokyo rivals. At the birth of the Japanese League the Tigers were considered the preeminent team in Japan, but from 1939 the Giants took control. The Giants have since pipped the Osaka team to the Central League no fewer than 14 times, and it is possibly this reason for which Tigers fans dislike the Giants with such a passion. There is of course the continued Kanto and Kansai rivalry in all walks of Japanese life, but another reason for this animosity is the way that the national media, including that of the Yomiuri Group that owns it, has a tendency to paint the Tokyo team as ‘Japan’s Team’. The rivalry between the two teams, one often compared to that of the New York Yankees and the Boston Red Sox, is perhaps best summed up by The Emperor’s Game, the most famous game in Japanese professional baseball history. The two teams faced each other on June 25, 1959 at Yomiuri’s previous home, Korakuen Stadium. When these two titans of the game line up, it is always a dramatic occasion, but this meeting was particularly special, as it marked the first time Emperor Hirohito had ever attended a baseball game. The players were tense, and according to Rob Fitts’ biography of Giants star Wally Yonamine “for many of the players, performing in front of the Emperor was more significant than playing in the Japan Series.” The game however, did not disappoint. Like the history of the sport, it was Tigers who went ahead in the tight battle. The Giants then took the lead, as supremacy swung back and forth between the closely matched opponents, until it rested at 4-4 in the 9th inning. As the Emperor had another engagement, and with the game heading for extra innings, his Highness waited to watch big hitter Shigeo Nagashima one last time. With the count at 2-2, Nagashima sent the ball ten rows into the leftfield stands. As the Giants players celebrated, The Emperor and Empress bowed slightly and left the stadium. The Giants were victorious. The professional baseball season in Japan begins with spring training in February and March, and continues with regular season games happening almost every day from late March or early April until October, and it is in the shadow of this bitter rivalry – two old clubs, one passionate, individualistic, idealistic; the other strong, the embodiment of the sport, metronomic in their success – that each new season begins. When Bono was writing “Where the Streets Have No Names” for U2 he was speaking metaphorically about social injustice on the streets of Northern Ireland. But there is a place where most of the streets do not have names and there is nothing metaphorical about it. It may just be common sense. That place is Japan. Most city locations in Japan are tied more to blocks, which are numbered, and not streets. There are some exceptions like Kyoto and Sapporo but the island is not about to adopt the Western style of wayfinding anytime soon. When you are asking for directions or consulting a map you will see sections marked out with numbers but no names on the thoroughfares in between. The Japanese addressing system is a mid-20th century take on an identification system started in the Meiji era of the late 1800s when the country moved away from the feudal system and into the world economy. There were apparently too many conflicts with place names and numbers were adopted. The country is not completely devoid of street names. Some streets have been given ceremonial names but are not the foundation for an addressing system. What’s good about the Japanese addressing system? First of all, the numbers are more or less sequential. This means that when searching for an address, or block, you will immediately know what part of town it is in and roughly how far away it is. In a western system you would be unlikely to know how far Broad Street is from Main Street or Elm is from Oak. In Japan, you do not have to worry about cross streets when searching for an address. With the numbered block system you also do not have to worry about how far a named street continues on the city grid or if the name changes en route. Whether a street is “East 21st” or “West 21st” becomes irrelevant so that potential for confusion is gone. The orderliness of the numbers makes finding your destination on a map quick and easy. Japan cities are usually quite generous with their posting of public maps for orientation purposes. Locate your section and pick out your route to your destination. What’s bad about the Japanese addressing system? You still have to train yourself to become acquainted with the particular streets in a city that will lead you to your desired block, unnamed thought they may be. Once you reach that block the individual buildings are not addressed sequentially – they are given numbers on the block according to when the structure was erected. The first building on the block is number 1, the second number 2 and so on. While this sounds fraught with difficulty, most Japanese city blocks are relatively small and most confusion will be short-lived. One more thing about addressing in Japan. Westerners are used to creating addresses beginning with the smallest geographical point and building to the largest. For example, the street address, then the city, then the state. In Japan, addressing is exactly the opposite. Addresses are written with the prefecture first and then the notation works down through cities and wards and blocks as necessary. The same holds true for districts which are comprised of towns and villages. Although this park is most famous for sea bathing and various water sport activities from July to August each year, during the off-season there are still quite a few unique activities to take part in. Digging for clams along the shore is one such activity, and it is possible every year in the spring from early April to June. Just an hour’s train ride south from Osaka on the Nankai Electric Railway main line to Nishikihama Station will bring you to this gorgeous and exciting daytrip destination. Whether scouring the beaches for clams is your pastime or not, all visitors can appreciate the beauty of one of Osaka’s 100 most scenic greenery spots. ‘Nishiki’ translates literally to “two colors,” and this title is in reference to the 1 km of white sandy coastline which meets up with the lush green forests of pine trees closer inland. If you are interested in gathering some clams, the event this year runs from April 15 to June 4 between 9:00 a.m. and 5:00 p.m. daily. Renting or purchasing equipment for gathering is possible at the beach, but feel free to bring your own bags, buckets, and shovels. Visitors pay a fee that grants them access to the activity, as well as the ability to take home up to 800 grams of clams as a tasty souvenir. Due to the potential for toxins in these shellfish, visitors must exchange their collections with inspected and safe clams at the reception desk to take home, but don’t worry, the actual gathering of the shellfish is completely harmless. This event is popular for families and groups with many picnic and barbeque areas that make for a perfect resting and snack spot. Smaller groups need not make reservations in advance, but for groups of 25 or more, be sure to fill out an application or give the Nishikinohama Tourist Association a call. Following a day of digging, there’s nothing better than enjoying some fresh shellfish for dinner as you watch the Spring sun setting over Osaka Bay! The tourism bureau of Nishikinohama also provides information on the best ways to cook and enjoy your fresh clams. Make sure to let the shellfish soak in salt water for up to three hours before cooking so they expel all of their sand. When: April 15 to June 4, between 9:00 a.m. & 5:00 p.m. The last visitors are admitted at 4:30 p.m. When one thinks of Nagoya’s parks there is a good chance that either Tsuruma Koen in Showa-ku or Meijo Koen in Kita-ku spring to mind, and there is a good chance that you haven’t even heard of Moricoro Park. And that’s a real shame, because there is loads to see and do, particularly if you have kids. Back in 2005 Nagoya played host to the World’s Fair, and aside from the addition of romaji place names to train and subway station signs (something of a lifesaver for those of us who arrived in the city unable to read hiragana quickly enough to know when to get off the train), Moricoro Park is probably the enduring legacy of that time. The park itself, officially called Ai-chikyūhaku Memorial Park (roughly meaning Love the Earth Memorial Park, with a play on words on the prefectural name Aichi and the word for love, ‘ai’) is a sprawling 1.85 square kilometers (460 acres) site set in the forested area of Nagakute. When you first arrive at the car park or train station overlooking the site, you can be quite taken aback by the park’s sheer size and, it has to be said, beauty, particularly if you visit during the spring’s cherry blossom season or during autumn when the trees turn their spellbinding shades of red, yellow and gold. The site is separated into various sites, and there is something to do in all of them. The first thing that you might like to do is to simply wander the grounds, enjoying the beautiful scenery. For a park whose very name encapsulates the idea of loving the Earth, it should come as no surprise that at every turn there is another beautiful flowerbed, a lake teeming with ducks, a thicket to explore or just a wide expanse of grass on which to lie, play or run around. As well as the scenery, there are also tonnes of activities to enjoy. For a start there is bicycle hire for both adults and children (highly advisable if you want to make your way all around the park as its sheer size can become a little tiring to navigate on foot, particularly for small children), but that is just the beginning. There is a year-round ice skating rink, a swimming pool, a children’s playground and even an immense ferris wheel from which you can take in the view of the beautiful surrounding area. In addition to all of that, fans of the Ghibli anime movies should not miss the extremely faithful life-size recreation of Satsuki and Mei’s house from the movie My Neighbor Totoro (Tonari No Totoro). Tours of the house can be undertaken, a must for any true fan both young and old, although be warned that at peak times such as weekends the queue can be quite long, so you may want to try to get tickets in advance if you can. Thanks to the Totoro house, Moricoro Park was the host of the 2015 Ghibli exhibition, however that is not the only event to take place there. Pretty much every week there is something going on, including music festivals, organic food markets, and eco clothing stall events. Most of these such events are related to environmental issues in keeping with the park’s theme, and particularly encourage children to get involved in group activities such as vegetable and rice planting. To see what is coming up, go to the events page of their website here. To get to Moricoro Park, take the Higashiyama subway line to its conclusion at Fujigaoka and from there take the Linmo line (on the magnetic levitation train that was purpose built for the 2005 Expo) to Ai-chikyuhaku Kinen Koen Station from where it is a one minute walk to the park. There is plenty of parking for drivers, costing 500 JPY for the day. If you are going to be known as the capital of something in Japan, there aren’t many better things than to be the “Food Capital of Japan,” a title often bestowed on Osaka. Every four years Osaka has hosted the International Festival UTAGE (Japanese for “feast,”) a sort of foodie Olympics with dishes on offer from around the globe. In the eight festivals since its founding in 1985 more than four million people have attended Japan’s largest food event. Osaka comes by its culinary identity organically. Ingredients flow easily into the city from the surrounding mountains and across its docks in its location on the sea. For generations the city has been known throughout Japan as “kuidaore,” a place where it is possible to “bring ruin upon oneself by extravagance in food.” Such delicacies as okonomiyaki, a grilled pancake of heavy flour with meat or squid; takoyaki, a round dumpling with chopped octopus as a highlight; and tessa, thinly sliced raw globefish, are famous Osaka creations. Kushikatsu, deep fried and breaded skewers of food, was also invented here. Japan can thank Osaka for such dietary staples as kaiten sushi (conveyor-style fast food sushi) and instant ramen noodles. Momofuku Ando perfected the flash-frying method for noodles after hundreds of experiments in 1958. The Momofuku Ando Instant Ramen Museum in Osaka, near Ikeda Station, stands as a monument to his achievement. Admission is free. Osaka chefs have been unusually open to international influences which makes the city the natural choice to host International Festival UTAGE. The world-famous Tsuji Culinary Institute in Osaka has graduated over 130,000 would-be chefs since its founding in 1960 and includes coursework in Chinese, Italian and French cooking in addition to Japanese techniques. Osaka takes its role as the kitchen of the nation seriously, maintaining the heritage of Japanese cooking while serving as a hospitality center for food-related activities. The International Festival UTAGE is co-sponsored by the Osaka Restaurant Management Association and promotes food-related industries and the stimulation of Japanese food culture. This year’s theme is “Festivals of Japan; Comparison of Flavors of Japan.” While bringing the many flavors of Japan to the guests the main focus will be on Washoku, the traditional “food of Japan” that has been registered as a UNESCO Intangible Cultural Heritage of Humanity. Washoku is the pursuit of harmony in cooking, not only blending the tastes of salty, sweet, sour and umami on the tongue but emphasizing beautiful presentation. Not all the food and drink is so high-minded at the International Festival UTAGE, although there is a special section on dietary education and food trends. There are plenty of edible sculptures to admire (while they last). Themed pavilions dish out treats from around the world and special pavilions in the Theme Zone are devoted to the local specialties, including a dizzying array of sake and shochu. There are regular stage performances throughout the run of the trade show. The “Feast” takes place at Intex Osaka and runs for ten days from April 28 to May 7. Admission is charged, scaling down from adults to children. Springtime in Japan provides temperatures, sights, and events that make it nearly impossible to spend your days indoors. However, even after a day in the warm sunshine, there are still many reasons why you don’t need to retreat back indoors for the evening quite yet. One of the most popular ways to enjoy your spring nights under the stars is to head up to one of the major cities’ best beer gardens. These rooftop escapes are just starting to open up all across the country for the spring and summer season. Take a stroll after sunset down any of the major streets of a big city in Japan and you’ll notice a number of buildings’ top floors beginning to illuminate with twinkling garden lights. Certainly the weather and the location of the beer gardens are important, but with so many to choose from, you really can’t go wrong. Don’t fret if you’re feeling overwhelmed, however. Not only are there many days of beer garden season for you to try out some different spots, but we’ve also rounded up a list of our five favorites across the country to get you started! Tokyo has extensive options for rooftop dining and drinking, but Forest Beer Garden offers an experience that stands out. With a seating capacity of up to 1000 guests, this rooftop restaurant often feels more like a beer festival than an intimate evening outing. Unlike many other rooftop gardens in Tokyo, Forest Beer Garden is family friendly with a delicious all-you-can-eat buffet that will keep both children and adults satisfied well into the night. Head over to the fish market district for one of Nagoya’s liveliest beer garden atmospheres. Yanagibashi hosts live entertainment almost every night, which is an appropriate accompaniment to the bottomless beers they serve! Be sure to check out their website for an updated schedule of performances. If you’re looking for a cultural twist on the traditional Japanese Beer Garden experience be sure to head over to Aloha Hawaiian BBQ where the spirit of the islands will grace your evening. On the weekends you can enjoy a traditional hula or Tahitian dance performance as you transport your tastebuds to Hawaii with a large selection of delectable island fare. For a truly authentic and historical beer garden experience, head over to Kamishichiken Kaburenjo Theater. Built in one of the oldest Geisha neighborhoods just 30 minutes from Kyoto by train, guests of this restaurant can enjoy a cultural evening like no other with traditional Geisha performances in the evening and the opportunity to be served by a Geiko or Maiko. Come to the Med 22 to get your fill of delicious Mediterranean cuisine with a Japanese beer garden atmosphere. With live performances throughout the weekends, delicious authentic Mediterranean cuisine and views of the glittering city of Hiroshima, the Med 22 is certainly worth checking out this beer garden season. With 73% of Japan’s land mass being mountains, hikers and outdoor enthusiasts certainly have their pick of gorgeous terrain to explore throughout the country. Of course there are some popular highlights that should remain repeat offenders on your Japan bucket list, like Mount Fuji. But if you’re interested in some seasonally-specific hikes that are sure to satisfy your natural cravings, there’s no better time than the warming season of spring. As the winter wears away and the vibrant greens and fragrant blossoms emerge, these gorgeous hikes will surely make their way into your spring schedule. As far as spring hiking in Japan goes, no list would be complete without including Mount Yoshino. Notorious for its unparalleled views of over 30,000 sakura trees, this hike may be crowded during cherry blossom season, but the beautiful scenery makes it well worth the crowds. The hiking route along this temple-laden world heritage site is paved to make for a stress-free nature experience. Located just an hour south of Tokyo, Mount Takao makes for a perfect spring day trip from the city. Standing at 1,965 feet with eight different hiking paths to choose from, this mountain is a popular destination for hikers of all ability levels. Boasting over 1,200 different species of plants and animals that are just beginning to re-emerge from the winter, this mountain is a prime spring hiking destination. Surrounded by mountains and the sea, Sendai is home to many gorgeous hiking destinations. Kamakura is one such destination, and the hidden temples, lush forests, and historical figures that line the varied trails give this nature destination unique character. Standing at 775 feet, this mountain is good for all experience levels of hikers. Just two hours south of Tokyo by train, this mountain provides the perfect views to complement your next spring day trip. As an added bonus, if you make it to the top while the sakura are in bloom, you’ll get a chance to see the cherry blossom trees that line the peak in all of their glory. Located in the Alps, this spring hiking destination might be your best bet to beating the crowds. Due to the lingering cold temperatures, not many visitors make their way to this national park before summer. However, spending your day in the sunshine and solitude along trails where the warmer weather is beginning to preview the beauty of spring is an experience in Japanese hiking not to be missed! Tokyo is such a marvelous city to explore, which is why it is a shame that we spend so much time on trains and subways being ferried from one place to another, never really getting to understand the lay of the land. The best way to really understand the city is by bicycle, but so many people who choose to tend to clog up the sidewalks with their ‘mamachari’ bicycles. According to the Japanese National Police Agency, there were 71.551 million bicycles in Japan in 2013 but most people tend to ride what even my dear old mother would call ‘old lady bikes’. But if you know where to look, you can find some great bike shops around the city that sell all sorts of specialized cycles, including road bikes, mountain bikes, commuters or even BMXs. So, what are you waiting for? Get off the sidewalks and start really enjoying this wonderful city and its beautiful surroundings! Y’s Road is perhaps the biggest chain for bikes in Japan, with 19 stores in the Kanto area alone. It stocks all sorts of bikes, including mountain bikes, road bikes, triathlon and folding bikes. Expect to find all the top brands as well as an extensive selection of apparel. Founded by friends Toshi and Wakako with a shared love of Japanese track bikes, Blue Lug is a great little store that is a bit more for an aficionado than Y’s Road. With production bicycle frames, custom frame building, custom painting, bag-making, a café and more, there are two branches in the city, Shinjuku and Setagaya. Precision and artistry combined. While longevity isn’t necessarily a guarantee of excellence, as Friend Syokai has been around since 1933, you imagine that they must do something right. As it happens, it seems like they are, as they are well known as a high quality bike shop stocking a wide range of stock bike of road, mountain, cross, and folding bikes. If BMXing or fixies is your thing then you should check out W-BASE. Manager Yohei worked in San Francisco as a messenger before opening this little store with a selection curated towards independent and specialized manufacturers for a crowd who know their stuff. Punch Cycle is another haven for the fixed gear bike lover. The steel framed bikes are generally built by hand to tightly regulated specifications and are highly sought after worldwide. This one gets fixie lovers seriously raving, and as it is open only in the evenings, they gather there as the sun goes down to pump owner Naoki Kitajima with questions. If you are keen on getting out on your bike, there are a couple of cycling groups in the area. Check out Tokyo Cycling Club, Half Fast Cycling, or Tokyo Running Swimming Cycling Club, amongst many others.